New lottery ticket featuring Mike Wolfe. The eastern Iowa man who turned his love of searching through dusty old barns and outbuildings for hidden treasures into a TV show is now featured on an Iowa Lottery scratch ticket. 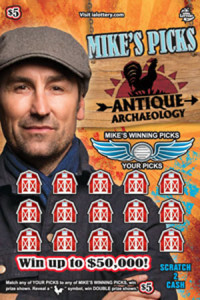 Mike Wolfe of Le Claire, the creator and star of the History Channel show “American Pickers“, says officials from the Iowa Lottery and Iowa Tourism came up with the idea for the ticket. “We started talking about — oh gosh — almost two years, the idea of putting what I do into your hand as far as a treasure hunt. So, it’s a scratch ticket and you can win up to $50,000,” Wolfe says. The ticket features a picture of Wolfe and the logo from his two Antique Archeology stores in LeClaire and Nashville, Tennessee. The $50,000 is the most cash you can win with the five-dollar ticket, but there’s also trips you can win to Le Claire, and a grand prize trip to Nashville. “When you go to Nashville, you can go to the Nashville store and also to the Grand Old Opry. And there’s also product you can win from 12 of my favorite businesses in Iowa,” Wolfe explains. Wolfe is executive producer of the American Pickers show and says as they start working on their sixth season, he wants to focus on some Iowa picks. “So, we’ve already started putting our feelers out about this season. It takes us about a year to film a season,” Wolfe says. Wolfe travels Iowa and the country with Davenport native Frank Fritz on the show. Fritz has his own store in Savannah, Illinois, just upriver from Clinton. He is not part of the ticket with Wolfe. He says they are on the road about seven months out of the year and it is harder for him now because he has a two year old daughter back at home. The tickets are now on sale. You can find out more about the tickets, rules and prizes on the Iowa Lottery’s website: www.ialottery.com.